Our web page was designed for people to access a sample of some of the articles which are published weekly in The Wanderer. Of course the best way to receive the wealth of information from The Wanderer is to become a subscriber! The web page also provides an excellent avenue for ordering the many products The Wanderer sells. 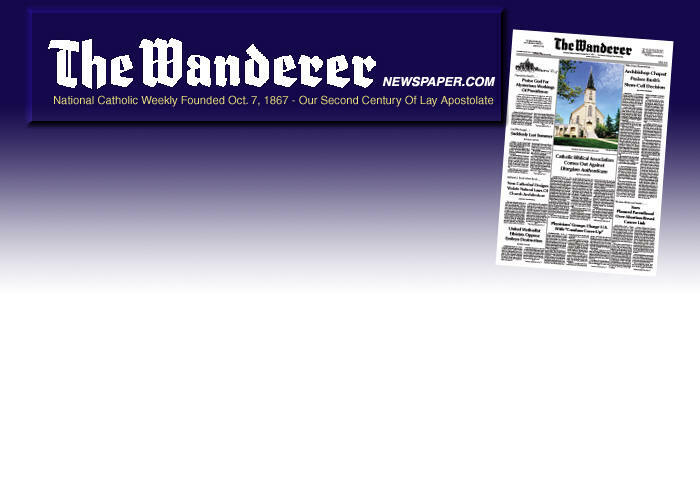 The Wanderer has been providing its readers with news and commentary from an orthodox Catholic perspective for over 135 years. From vital issues affecting the Catholic Church to the political events which threaten our Catholic faith. The Wanderer is at the forefront every week with its timely coverage and its cutting edge editorials. The Wanderer Front Page . . . Recent articles and editorials . . . Please send me a sample copy!